Designed to coordinate with SmileGoods toothbrushes and provide an inexpensive alternative to higher-priced floss, each pocket-sized dispenser holds 12 yards of high-quality nylon or PTFE floss. See-through plastic dispensers are color coded by style and flavor. The floss is available waxed or unwaxed and with unflavored, mint, or bubble gum flavored varieties. 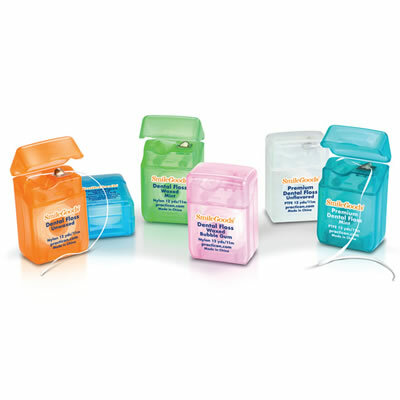 SmileGoods floss is packaged 72 dispensers per case.